It’s 5am as a crowd of clubbers tumbles out of the CLF Art Café, a warehouse venue in the Bussey Building at the epicentre of Peckham’s Rye Lane. Though sunrise is yet to arrive, the restless, seen-it-all-before eyes of bouncers are detectable, their hi-vis jackets illuminated under lamplight and neon shop signs. Home-time tantrums echo through the long alleyway that connects club to street. But as sweat meets cold air and the appetite for the night to carry on ebbs, there is silence. It’s hard to believe that in barely six hours, pastors, elders, prophets and prophetesses in immaculate, white religious cloth will start their procession along this alleyway, heading towards their congregation within the Cherubim and Seraphim Church, which sits opposite the CLF Art Café, wedged between the Kiln Rooms ceramic studio and a digital fabrication workshop. Just after 11am, minutes before service begins, Alex, an elder, tells me that the church has occupied the warehouse space on the Copeland industrial park for over a decade. The park’s site map constantly needs amending, as businesses fail and startups move in, and it has meant that this church and another African congregation at the back of the estate outlive the majority of the companies and creative spaces that have been on the site. Like many of the groups here, these churches are charismatic and colourful and have developed large, committed communities, but they aren’t featured on the posters selling the park’s studios to the young creative classes. A phrase I have often heard in relation to Peckham is that it’s a ‘melting pot’. But as a description of cities, it’s usually a false analogy, one that has globally given way to the metaphor of a ‘salad bowl’. And while some cities do better jobs than others of encouraging that salad to be fully mixed, in many cities we see fragmented communities segregated down lines of culture and interest, operating alone in the same space. At times, this can create friction, sometimes grow combative, but at other times it appears everyone’s in on it, an arrangement that plays out like a carefully choreographed dance. Estranged yet harmonious. Estate agents, the local council and the media describe Peckham, sometimes romantically, as a ‘diverse and vibrant’ single community, a simplistic unification that is also borne out in the descriptions of the grouping of black majority churches under the umbrella of African Pentecostalism. Having spent a lot of time in London, I have seen that people living in proximity is rarely the same as togetherness, and I wondered what sort of togetherness existed in Peckham. Is there such a thing as a single community and could that be found in a community brought together by its shared faith? As I walk through the Copeland car park, Pastor Victor greets me with a smile. It’s the final day of a five-day festival at the church, but he shows little sign of weariness. Noting his excitement, I ask what the service will be about. “Today? Today will be about togetherness. This past week we’ve spoken about spiritual education, fulfillment and personal development, but today we will share with each other and come together to praise God.” As he and the other elders make their way into the church, members bowing respectfully as they pass, thousands of other people in Southwark will come together to share their faith. According to a Roehampton University report published in 2013, there are 118 black majority churches in Peckham — a concentration of African Christianity greater than anywhere else in the world, outside of Africa. The borough of Southwark, which contains Peckham, has the largest African population in London, including Nigerians, Ghanaians, Somalis, Sierra Leoneans and communities of various other nations. But it’s not only the demand from a high concentration of churchgoers that has brought about such a proliferation of spaces for worship, there’s diversity to be served. The churches in Peckham provide for these differing subcultures, and are variations of Apostolic, Baptist, Pentecostal, Charismatic, Gospel, independent, and a Jehovah’s Witness near Peckham Rye Common. Some services are delivered in English, some are multilingual, others exclusively in native tongues. It’s also a liberal landscape in that there is a widespread acceptance of contrasting religious beliefs, and that the many independent churches operate outside of the religious institutions that Britons would ordinarily be familiar with. But they are institutional to a degree. More like franchises of a greater international network of churches, often formed in their home countries, before expanding to where there is a need. Like Copeland Park’s Cherubim and Seraphim Church, formed in the Ondo state of Nigeria by a minister who was said to have begun performing miracles while still in the womb, or Freedom Care International with branches in Accra, Dallas and, less colourfully, Luton. “Just as the Catholic Church’s spiritual home is in Rome, ours are in Nigeria,” says Pastor Prince of the ESOCS Church Fountain of Blessing in Elephant and Castle. I meet him in Docklands College, which sits above a branch of Barclays Bank on Rye Lane. I’m looking for Pastor Obie, who serves a small congregation in a classroom here. Instead, I find Prince speaking on his phone, flat cap in wildly gesticulating hand. He mirrors the tone of his church, where informality is a token of its warmth. As well as a pastor, he is also the property manager of the college, whose teaching rooms transform into churches in the evenings and weekends, providing space for Obie’s church and one other. He tells me that it used to house three churches, but the other was “too noisy for the neighbourhood”. The last of these is a promotion for Yogarise, a practice in the Bussey Building. I clock this one because it’s midday, and while the services are underway, the streets are filling with clear-headed folk exalted by the morning’s downward dog. Indeed, all over Peckham, communities of yogis, CrossFitters, military bootcampers, boxers and gym bunnies are revelling in their weekend detox. Businesses of self-improvement, everywhere. But while the message of some churches and fitness centres may be similar, it’s rare to find a workout that has inspired social action, especially not of the sort that the Bible inspired in Felicia, a former foodbank manager at PECAN, a community development charity on Peckham Road. Felicia is a high-energy woman who came to England in the 1970s, aged 11, and built up a property portfolio. Around her 45th birthday, she set a goal for herself: to sell up and retire by 2010, when she would be 50. In 2008, the financial crash hit. Prince Daniel streams his sermons online, finding audiences around the globe. This chimes with another key element of most congregations’ communities – many of their members are far from local. Congregants travel from across the South East each Sunday to attend their churches. I heard various reasons for doing so, but it’s often motivated by the fact that in many areas of London only traditional Church of England, Methodist and Roman Catholic churches exist. Nowhere offers as much choice and diversity as Peckham. Come 2pm, the singular uses of space witnessed in the morning yields to more of a melée on Rye Lane. The volume increases, as people haggle with stall owners over fresh fruit and vegetables. A roar in response to a Six Nations try booms from The Nags Head, where drinkers are limbering up for an England match later in the day. A bus driver toots at a breakneck fixie rider, the chatter increases in the nail studios and hair salons, as reggae and gospel music challenge one another within the narrow indoor arcades. Perhaps Rye Lane is an archetype of salad-bowl multiculturalism, where disparate communities share space with minimal interaction. But to say that the people of Peckham chose such a community is insensitive to the organic circumstances that created it. For a neighourhood that eschews it, that favours coexistence over community, the fear is that when people don’t work together, they find it difficult to resist council- and mayor-led plans for change. To some, Peckham is loud and unattractive, and needs, for the continued lack of a better word, ‘regenerating’. Various such plans exist across London to reproduce supposedly tired neighbourhoods in the likeness of star students: Shoreditch, Hackney, Croydon and their ilk. 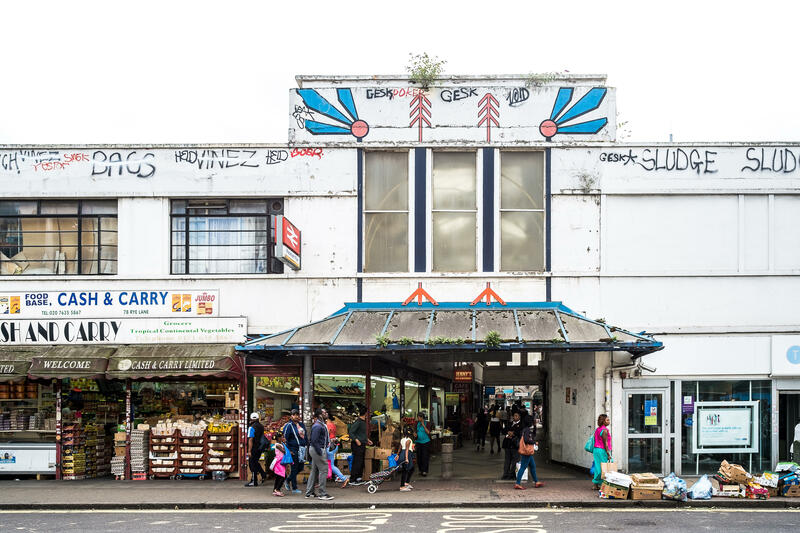 One plan exists that will transform Peckham and will, like the others, piggyback on its diversity in order to add new housing and redevelop existing sites into something that more closely resembles the formula of a successful neighbourhood. Perhaps then we’ll see a single community in Peckham, in all its homogeneity. But it’s too soon to tell how that will be defined, and what the true cost will be.